KWIK LOK. 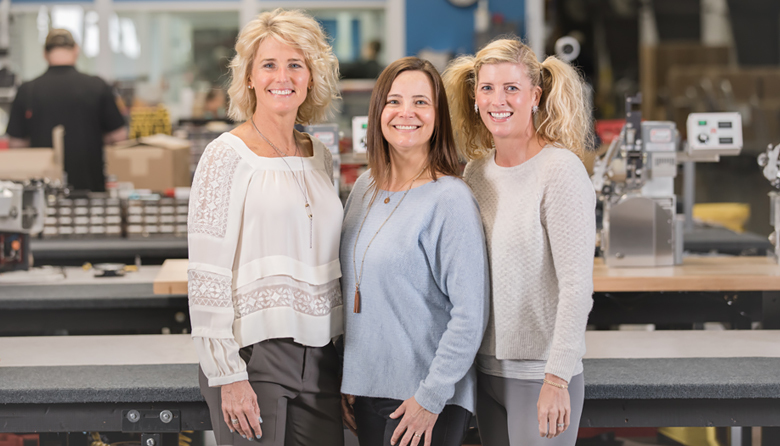 Owners, from left, Stephanie Paxton Jackson, Kimberly Paxton-Hagner and Melissa Steiner. More than 60 years ago, Floyd Paxton had a California business making box-nailing and labeling machines for wooden produce boxes used in Washington’s apple industry. On a trip to visit packing houses, he noticed a new packaging phenomenon — plastic bags — and he was asked about how to keep them securely closed. Family lore has it, though there’s no proof, that Floyd whittled the first Kwik Lok clip while flying home. With his first closure prototype, Paxton moved to Yakima to launch Kwik Lok in 1952. His son, Jerre, became president in 1968 and led with a hands-on management style for 47 years while growing the company globally. Kwik Lok makes billions of clips each year, primarily for produce and bakery companies, while also manufacturing the machines food producers use on their assembly lines to apply the clips. Developed in the early 1960s, the machines today offer printing capabilities for coding and dating. Selling in more than 80 countries, Kwik Lok has more than 330 employees, including 130 in Yakima. It operates another domestic plant in Indiana, and has international facilities in Canada, Ireland, Australia and Japan. Some uncertainty entered the picture in early 2015 when Jerre Paxton died. He left the company in good financial shape but never created a succession plan or involved other family members as employees. Decisions fell to his daughters, Kimberly Paxton-Hagner, Melissa Steiner and Stephanie Paxton Jackson. Some heirs might have sold but the sisters say they realized legacy was at stake — plus continuing decades of support for employees and clients. They backed bringing in non-family CEO John Rothenbueler, previously the longtime independent CPA for Kwik Lok. The sisters, now all on the company board, vow to continue family ownership.